The Division further recommends that the outdoor patio be closed at 12:00am on Sun-Wed evenings. On all other evenings, the MLCC restrictions would apply, as is currently the case. 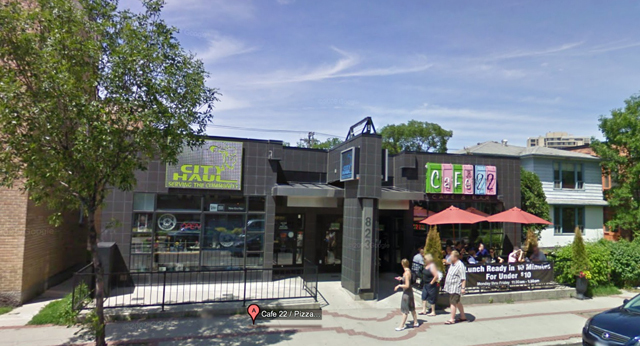 @kentonlarsen reporting this morning: “Letter in mail: Cafe 22 on Corydon intends to knock down nearby duplex and build a large patio. That would be the property in blue to the east of the current site. I believe it’s a rental. On a side note: I always thought there was intense scrutiny of new/expansions of lounges and bars in the Corydon Village area…public hearings etc. Did I miss this? This is the first I’ve heard of this proposal. I find that odd because I love pizza and drinking. Think I first saw this from One Man Committee. Hey John: Your point being? It wasn’t meant in any negative light. I found it interesting that OMC found the previous plan for the site. I had nearly forgotten that there had been a design for the duplex previously that didn’t happen for one reason or other. I have been following the approvals for some other places like Fazzo and Mise over the last year or so and I can’t say I’m surprised that there is another plan for around Cafe 22. I suggested in my comments on OMC that parking is likely to come up as an issue in the next years. It is getting crowded on Corydon. I feel you. Just didn’t want anyone thinking I was copying him. Parking will be the major issue – and that’s clear by the city rejecting plans for a medical clinic at “the new” Cafe 22 because of a lack of it. That Condo plan from years back would look really strange in that space – I like the design tho. I like how the recommended proposal reduces the 40-person patio to 37 people. Those three fewer people will make all the difference, I’m sure. Come on, Bruce. Everyone’s got to make concessions. The house is, I am told, in need of extensive repair. Given the number of jobs the proposal would bring to the area, and the new office space above, the trade off of housing in a duplex for perhaps 5 -7 people seems to be the trade-off. Over 500 people have signed petitions in favour. I take absolutely no issue with this proposal in any way. Looking forward to seeing it next summer. Possibly due to your interest in pizza and drinking. Parking? Meh. I always take cabs to Cafe 22 – it’s the one place in the City where it’s easy to flag a cab to get home, half in the bag, in the other direction. Get them to finally put a cabstand for the Corydon strip across the street, for God’s sake. My only fear is that if expanded, the place will lose its distinctly Post-Winnipeg ambiance. Plus, they’d better keep capers on the menu for the Big Slice, or that could be a dealbreaker, too. It looks like parking was not even a consideration. They crippled the proposal because of vandalism and crime even though Cafe 22 appears to have no link to any of that. It really makes no sense. I’ve been there countless times — in fact, worked basically right next door to the place for 7 years — and there was never, ever any trouble that I saw. Given the relative support Cianflone seemed to garner from people in the area, I’d be incensed if I were him. I bet the appeal document’s already been filed.